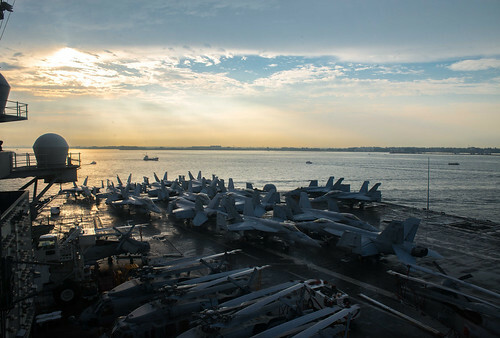 SINGAPORE STRAIT - The Navy’s forward-deployed aircraft carrier, USS Ronald Reagan (CVN 76), departed Singapore June 21 after a scheduled four-day port visit. 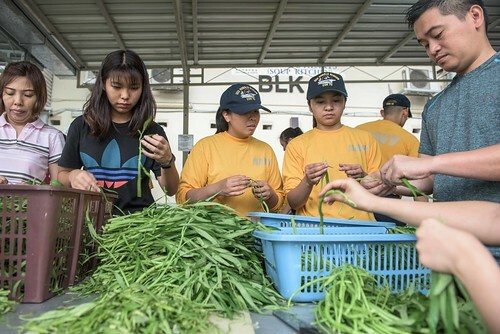 Ronald Reagan arrived in Singapore June 17, and Sailors had the opportunity to experience local culture and participated in a variety of command-sponsored projects and tours. Ronald Reagan’s Command Religious Ministries Department coordinated six projects for Sailors to interact with the local community, including volunteer opportunities at a soup kitchen, a food bank and interacting with early intervention, pre-kindergarten and kindergarten special needs students by helping them with homework and assisting teachers with assignments. “Community relations projects are an incredible opportunity for us to meet the local community and represent our Strike Group and the United States as ambassadors,” said Cmdr. David Yang, command chaplain. Reagan Sailors also experienced Singapore through nine tours offered by the ship’s Morale, Welfare and Recreation (MWR) Department. Tour packages included trips to see some of the country’s botanical gardens to a night safari experience. In addition to tours and community relations events, MWR also held a variety of sporting events that allowed Ronald Reagan Sailors to compete against other strike group Sailors and local sporting teams. The list of sports included soccer, volleyball, softball and basketball.